This last week has bean surreal. In a very good and absolutely mind-blowing way. We have been in London meeting lovely blog readers, signing books and doing more than a few magazine interviews. We had coffee on Columbia Road, Indian food at Broadway Market and Elsa danced her feet off to an Italian street band performance. We finally got to eat at Ottolenghi, it was just as perfect as we expected. We also tried The Gate, and it was almost as good. Food for thought was precisely as cozy and delicious as we’ve been told. We found our book in a real, old fashioned bookshop and actually felt like authors for a while. 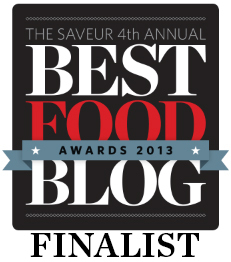 And when we thought our week couldn’t get better, we received an email telling us that Green Kitchen Stories is a finalist for Saveur Magazine’s Best Food Blog Awards, in the Special Diet category. We are accompanied by some of the most creative and talented bloggers that we know, so it is all pretty insane and unbelievable. If you would like to cast your vote on us we would be MADLY grateful. Click here to vote! You need to sign in or register first, but it only takes 30 sec (and they promise not to spam you). Polls closes Friday, April 19. Thank you so much for your support! And now on to the food. We have had Vegetable Literacy on the top of our book pile for a while. But just before we left, we finally got around to trying a recipe from it. 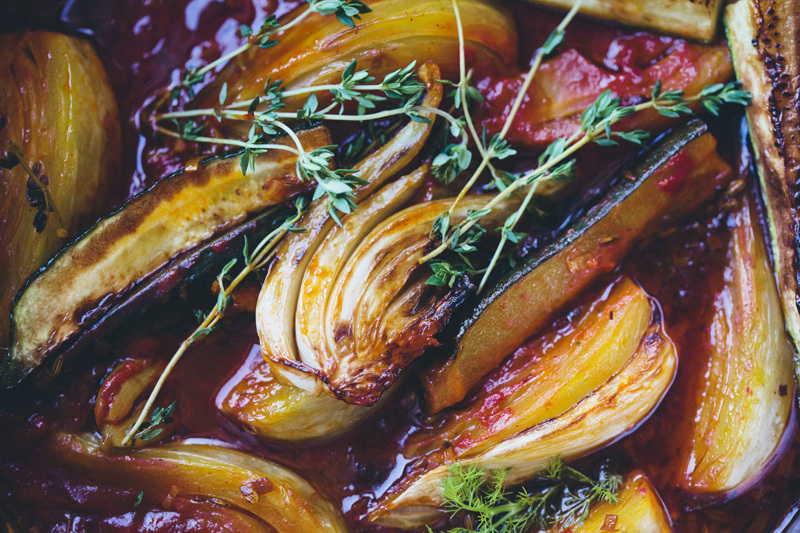 Our eyes immediately fell on this braised fennel that is cooked in a tomato sauce and flavored with fennel seeds and saffron. It is one of those recipes that makes total sense, all the flavors are perfect together, it tastes sweet, warm and comforting. A truly wonderful dinner. Our only regret is that we didn’t come up with this recipe ourselves. Since we are a hungry family we also braised zucchini and added to the pan, and used ghee instead of olive oil for extra yum. The zucchini worked perfectly together with the fennel. We served it with brown rice, but quinoa would be great too. Vegetable Literacy, by Deborah Madison, is a wonderful and beautiful book. 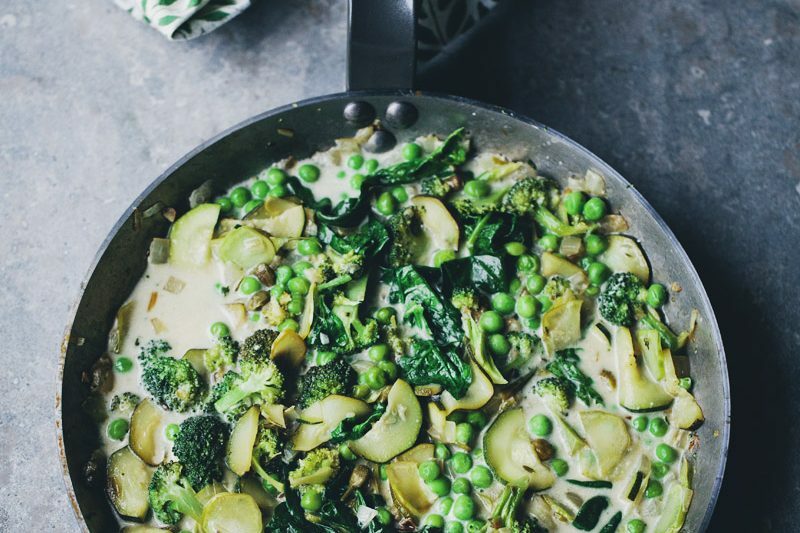 It is all about putting the vegetables in focus and reminds us slightly of Tender, by Nigel Slater, another of our favorite books. Rinse the rice thoroughly, drain and place in a medium sauce-pan together with the water. Bring to a simmer, cover and lower the heat and cook for 40 minutes. Drain any excess water. Ready to serve. Trim off the stalks and greens from the fennel bulb. (Minces the greens for a garnish, if there are none, you can use parsley.) Halve the bulb lengthwise and cut the halves into wedges about 1, 5 inches/4 cm at the widest part. Halve and divide the zucchini and cut into wedges. Heat the ghee in a wide sauté pan over medium-high heat. When hot, add the onion and fennel seeds, saffron and thyme and cook for a few minutes while stirring occasionally. Add the fennel- and zucchini wedges and cook them until golden, turning them and the onions occasionally. Once they are well colored, add the garlic, stir in the tomato paste, and then add the water and salt & pepper. Scrape the pan to release the juices, then cover and simmer until the vegetables are tender, about 15 minutes. Serve with brown rice and fennel greens. PS. 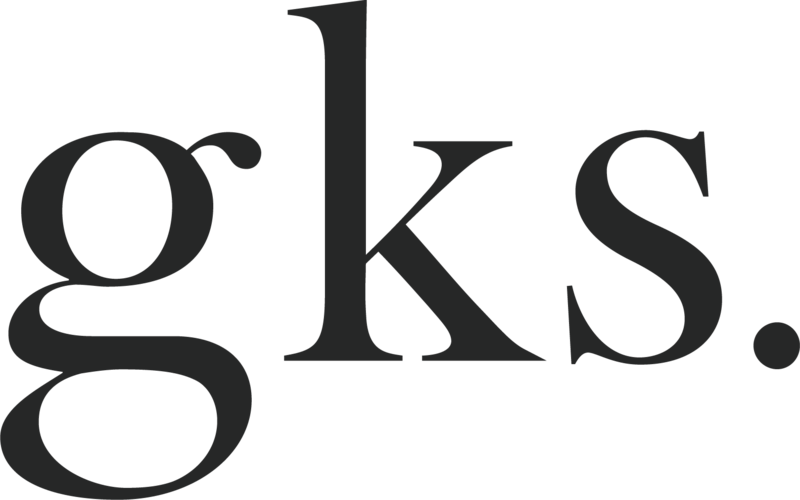 Here are a few links to some book related media clips and interviews from last week. • An interview with Four Magazine. • A Q&A with The Lifestyle Editor. • Our book was “Cookbook of the week” in The Telegraph. • Talked on the phone with The Lady. Just discovered you guys! Had your book as a belated birthday gift today and so am really inspired by the recipes! Thanks! Voted! great job, you guys! You have deserved it all! Your blog is such an inspiration. 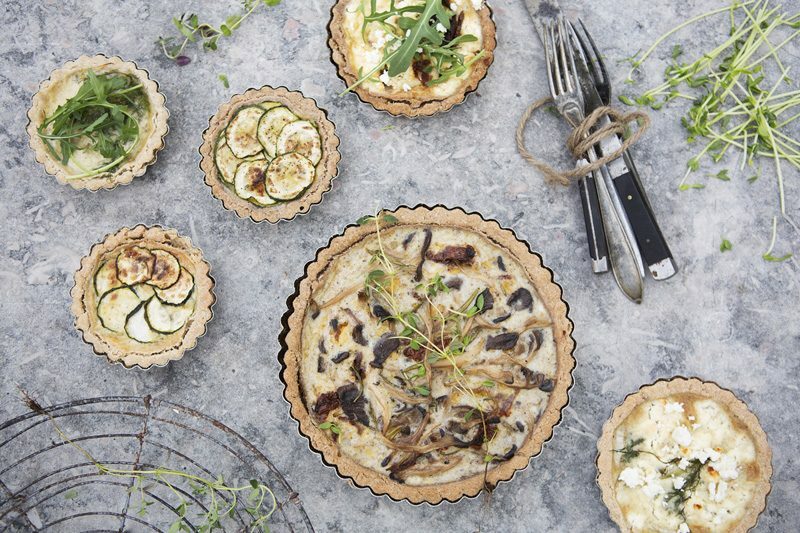 Luise, your recipes are always remarkable even if they are not totally your idea! Love the pictures as always and happy to hear that you enjoyed! Sounds like a perfect week with lots of fun and eating of course! You deserve all the goodness life has to offer your way because you truly have worked hard pouring in your heart and soul in making the book and sharing weekly in your lovely foodblog. The dish looks amazing, just added to my ever growing list. PS: I'll be teaching kids and moms to make your Saffron Buns this Saturday, I am so excited!! Such a gorgeous side! This sounds awesome! Yum! This looks delicious. Can't wait to try it out. Congratulations!! You've got my vote. That Deborah Madison is a genius, isn't she? So simple. 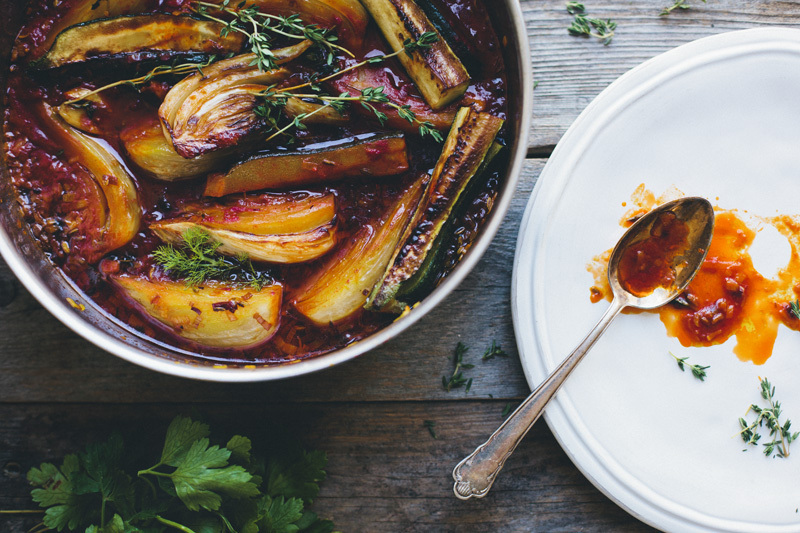 This lovely dish was also my first from Vegetable Literacy -- and I just love the idea of adding zucchini. Thanks! Best of luck with the Saveur contest -- you have my vote 100%! -Emily K.
You visited lots of my favourite places :) It sounds like a fun, but exhausting week I'm sure. How exciting to be the Telegraph's book of the week too! 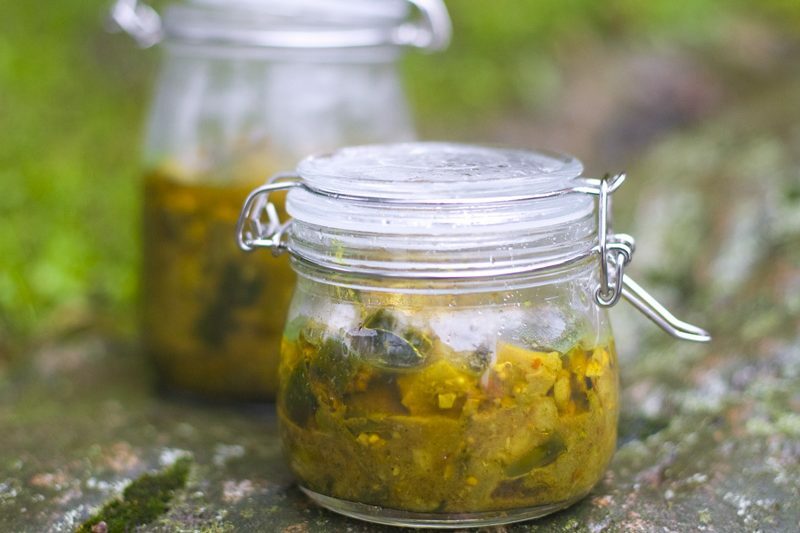 Look forward to trying this recipe- fennel, saffron and tomatoes sounds beautiful. Hi, you just posted this recipe right on time for me. I've never cooked fennel before and I had no idea where to start. 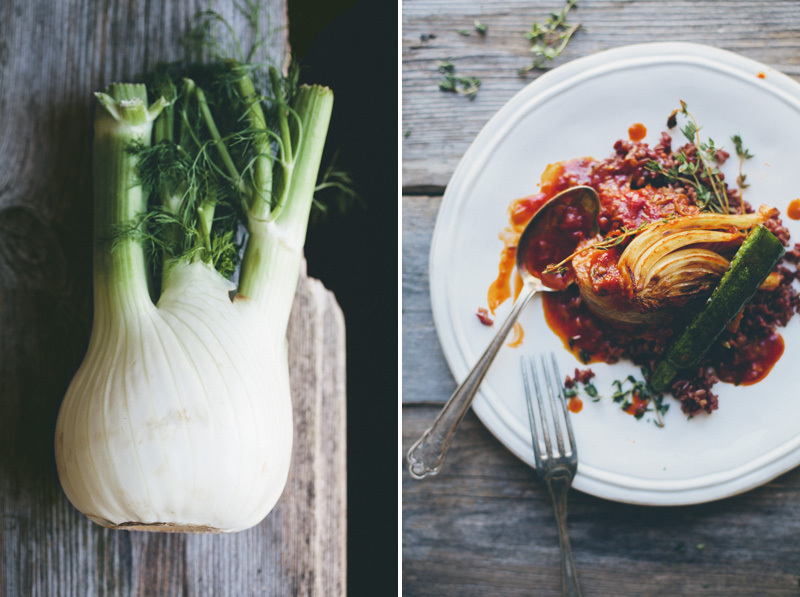 This recipe looks just perfect for the fennel bulbs I've bought the other day. Thank you for the recipe, I can't wait to try it! Congratulations, you really deserve it, your blog is amazing! 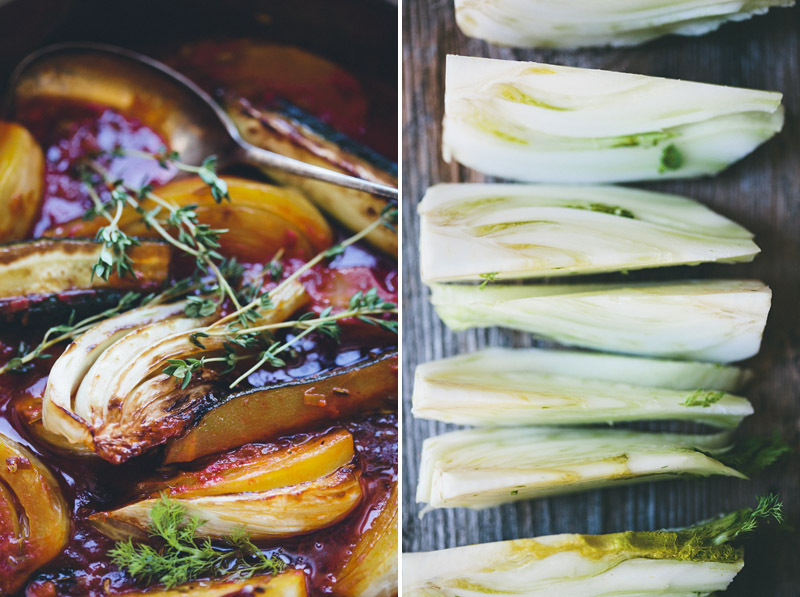 :) And this fennel looks so yummy, can't wait to try it! My vote is all yours...why not, you already have my tastebuds, my heart, my imagination and inspiration! The biggest congratulations to you and what a deliciously amazing week! Sounds like the perfect weekend! :) The pics are Beautiful. Many hugs from Amsterdam! Hi, thank's for the recipe, IT LOOKS DELICIOUS!. Fennel is all over farmers market at the moment. I was wondering where I could get your book here ins SPAIN, maybe just order it through the uk? Thanks again for sharing! Happy to hear you've had such an amazing week! My copy of the Green Kitchen cookbook finally arrived last week and of course I love it. 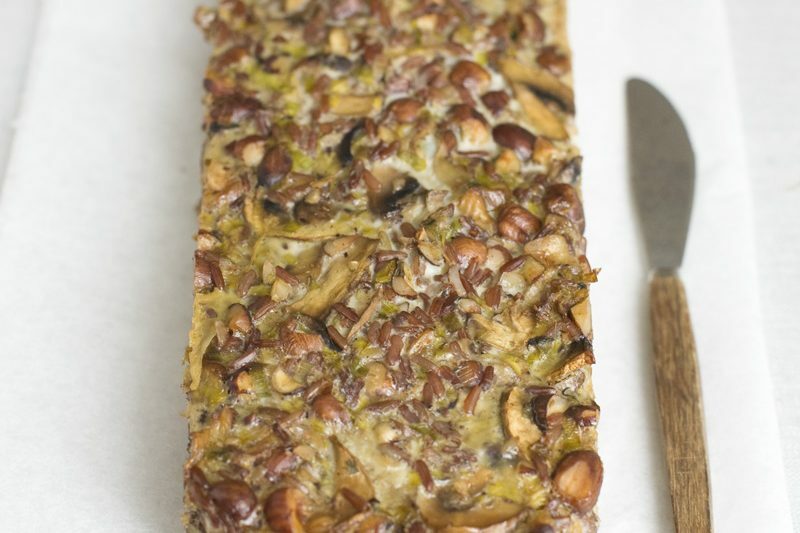 This recipe looks good too - I never really know what to do with fennel, so this gives me somethings to try. Aah you found my favourite bookshop! Many an hour I have spent browsing books for cooks. Well done for all your hard work. I'm enjoying the book so much, my only worry is that there is so much in this book, how could you possibly make another? !